Bürmoos is a community in the northern part of Salzburg′s Flachgau region with approximately 4,600 residents - and quite an interesting story. It is the youngest municipality of Salzburg and was "founded" only in 1967. The suffix "moos" is an old Germanic term for swamp or moor. It can be found in many parts of Salzburg. The area of Bürmoos was an essentially unpopulated swamp until well into the 19th century. Underneath the turf, there was a thick layer of clay which was suitable for making bricks - with the turf providing cheap fire material. The turf also attracted an industrialist who founded a glass factory in Bürmoos. Bürmoos grew to a proper hamlet of St. Georgen; it was to be considered to be among the poorest settlements in Salzburg prior to WWII. After the war, many ethnic German refugees from the Balkans moved into Bürmoos. Within a few decades, the population more than tripled. In 1967, Bürmoos ceded from St. Georgen - the same year, machines were introduced for cutting turf. This industrialisation led to severe damages in the environment and ever since the 1980ies, environmentalists lobbied for "renaturing" measures of the old swamps. Since then, a lot has been achieved. Today, Bürmoos is a prosperous village with a significant population that is well-connected to Salzburg via the railway. 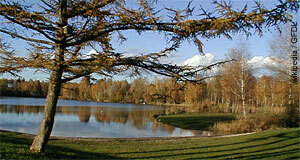 The turf cutting came to an end in 2000; there is an artificial lake at a previous clay pit and several environmentalist awards were won by the various projects to make Bürmoos and its surroundings a "secondary natural landscape". The swamps of Bürmoos were declared a Natura 2000 region of the European Union for their high abundance of birds. For international tourists, Bürmoos will have little to offer; if you live in Salzburg for a longer time and strive for some swampy experience, Bürmoos is more attractive. It is considered to be part of the Salzburger Seenland (Salzburg Lake District).